This luxury holiday villa is for rent in an exclusive urbanisation in Alcudia in the north of Mallorca, only 200 m. from the beach. Wonderful modern holiday villa for 10 with private pool, air conditioning, WiFi internet, indoor pool with Jacuzzi and amazing sea view! 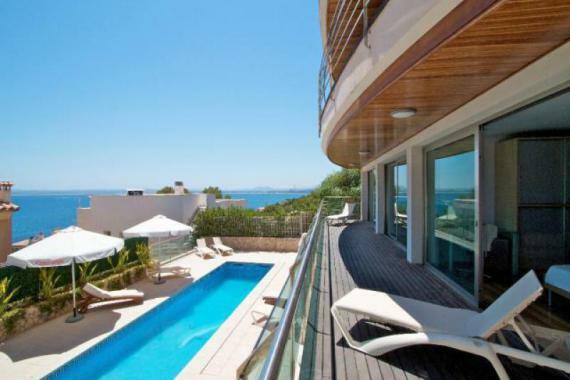 This luxury holiday villa (450 m2) comprises three floors with a large terrace each and a roof top terrace. Villa Seagull is very tastefully appointed and decorated in a contemporary style and enjoys spectacular views of the Mediterranean Sea. There is a spacious living/dining area with satellite TV, a modern fully equipped kitchen and a guest toilet. Furthermore there are 2 double bedrooms, 3 twin bedrooms and 5 bathrooms. The lovely pool is surrounded by a large sun terrace with sun beds and sun umbrellas. On pool level you will find an indoor pool area with Jacuzzi and fitness equipment. Holiday villa Seagull is located near Alcudia on the north coast of Mallorca. Beach: 200 m. Shops and restaurants at walking distance. Airport Palma de Mallorca: 65 km. Maid service once a week. Change of bed and bathlinen by mutual arrangement. Your comment will be queued for moderation by site administrators, so other people will not see it directly.